Our first installment of the 2018 five takeaways segment is mostly- though not all- positive. 1: The QB job belongs to Feleipe Franks… for now. Obviously, the biggest and most prominent takeaway of the game has to be the QB play we saw from Feleipe Franks, which, in a sentence, was the best we’ve ever seen from him. He made the throws he had to make, and even more importantly, didn’t make mistakes. So that’s good, because you could not say either about him last year, even against the really bad teams like Tennessee and UAB. But now comes the stock line that it’s impossible to judge him in this game due to the inferior level of the competition. So perhaps the key is “for now.” We’ll know much more about what we’ve got in him with Dan Mullen’s coaching after he faces Kentucky- a team that he played so badly against last year that Jim McElwain benched him. 2: The offensive line was extremely disappointing. Without a question, this was the biggest negative of the game. Florida should have been having its way with Charleston Southern, who the school paid $450K to come take a pounding, in the trenches for the full sixty minutes. That didn’t happen and the Buccaneers actually got some penetration at times, particularly on run plays. This isn’t a write off of the line as a whole- it was, after all, game one, and they’ll definitely get a chance to redeem themselves this week against Kentucky- but hopefully Charleston Southern just serves as a wake up call to a line that’s extremely talented but underwhelming so far. 3: Special teams is becoming special again. Not only did Florida block two kicks amidst their onslaught of points- one of which was returned coast to coast for even more points- but freshman kicker Evan McPherson nailed all three field goals he attempted. And though he didn’t get as many chances to shine as McPherson, fellow special teams freshman Tommy Townsend impressed with a perfectly placed 36 yard punt that pinned CSU back to its own 14 and a booming 53 yarder that flipped the field. It’s great to see Mullen reinstate the emphasis on special teams, if for no other reason than because of the memories it brings of the last coach who emphasized it. 4: Mullen knows what the fans want and knows how to deliver it to them. Well, how else should I synopsize Feleipe Franks’ jump pass? Schematically speaking, there was no reason for it. On a first and goal from the CSU 3, and already up 24-0, Florida was going to score one way or another and did not need the element of surprise the jump pass brought. But that wasn’t why he called it. The instant Franks jumped into the air, the crowd began to roar. 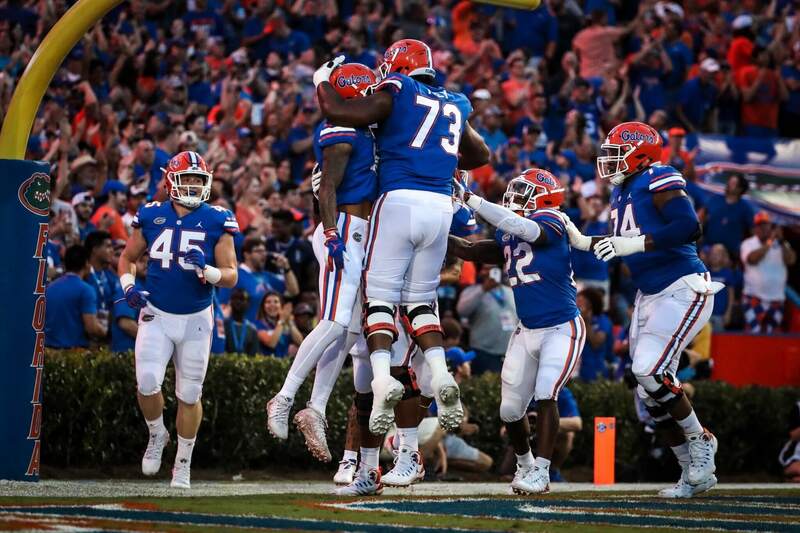 It was just the simplest of mementoes of the high flying offense Mullen oversaw in his first stint in Gainesville, but it proved that Mullen is aware of what the fans crave- and better yet, is willing and able to deliver it. 5: The play calling was far more inventive and unpredictable than it was under the previous two coaches. And yet I’m sure that it was nothing compared to what we’re going to see moving forward against the real teams. Still: receivers ran routes that were drawn up with a purpose, and Franks was given a little more rope to freelance a bit in the backfield. Florida also finished with more than 200 yards rushing and passing for the first time since last October’s 38-24 win over Vanderbilt. Yes, the run blocking was not good, but I thought the pass blocking was pretty solid all night. Hope our bigs can play with confidence and have a chip on their shoulders Saturday night. First home game I will attend in eight years, getting excited! Your first home game since 2010? Wow, let’s link up!